1 00% brand new and made of high quality Aluminum Metal material. Precisely cut openings to allow full access to all the functions of your device. Compatible Models: for All Versions 38mm/42mm Apple Watch Series series 1/2/3 ,Sport/ Edition/ Nike+. 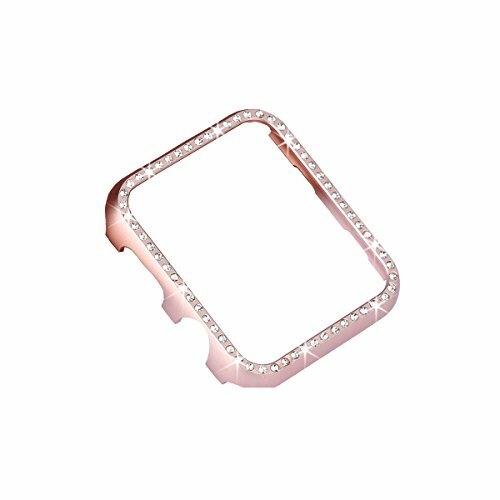 For APPLE WATCH ：Premium Metal frame case,provides ultimate protection from scratches for your precious apple watch, ensures it in steady and secure. Please note our cases are not screen protector. Fashion 3D bling metal case can definitely make your watch look much more elegant and luxury. CONVENIVNET TO USE：Through precise process, this case fit the Apple Watch very well. You can have accurate access to the screen, power button, the Digital Crown and the speaker. 100% Satisfaction Guarantee: This bling case is handmade, it maybe damaged in transit. If the crystals come off, pleace contact us at first. We will reply you within 24 hours and try our best to solve your problems. If you have any questions about this product by SD Trading, contact us by completing and submitting the form below. If you are looking for a specif part number, please include it with your message.